Support in German Chancellor Angela Merkel’s coalition for a major new Russian gas pipeline is slipping as frustration with the Kremlin’s brinkmanship grows and pressure from U.S. President Donald Trump starts to bite. Social Democratic lawmaker Nils Schmid, whose party has been a reliable supporter of the project, said too many decision-makers in Berlin had been slow to factor in Nord Stream’s geopolitical significance. It will reduce the volume of gas pumped through Ukraine as Russia attempts to stifle its neighbor’s economy by depriving it of lucrative transit fees. 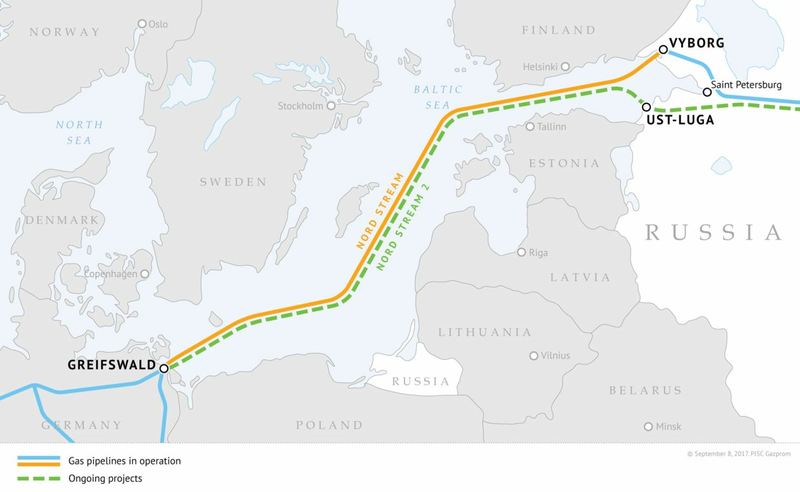 The 1,220 kilometer (758-mile) Nord Stream 2 undersea link to Germany initiated by Russia in 2015. The 1,200-kilometer (750-mile) undersea pipeline -- being constructed by Russia’s Gazprom PJSC to bolster German supplies as Norwegian, Dutch and domestic sources dry up -- has been pilloried by some of the country’s allies, who say it bolsters Europe’s reliance on Russian energy and bypasses key partners such as Ukraine. Trump has blastedthe project as holding Germany “captive” to Russia. The ground is shifting, with an ever more fraught relationship with Russian President Vladimir Putin, particularly since the November seizure of two dozen Ukrainian sailors near the Sea of Azov. Merkel, who has sparred with Putin since the 2014 annexation of Crimea from Ukraine, is demanding the release of the naval personnel. The Azov incident in the Kerch Strait has soured prospects that Merkel’s diplomacy can scale back the conflict in eastern Ukraine, according Juergen Hardt, a lawmaker in Merkel’s Christian Democratic Union who speaks on foreign affairs. Hardt said Germany’s governing parties need to find consensus with the European Commission on energy diversification and reliance on Russian gas. He also questioned the economic viability of Nord Stream, poking holes in the government’s previous defense of the project. Merkel shifted her position on Nord Stream last April, acknowledging the political dimensions of the pipeline and departing from her previous insistence that it was solely a business venture by private investors. The project must not weaken Ukraine by disrupting its gas transmission system, she said at the time. Richard Grenell, the U.S. ambassador to Germany, welcomed the more skeptical view in Berlin, saying the pipeline project undermines the EU’s energy and security objectives. The U.S. administration has indicated that sanctions on the pipeline are imminent. Trump brought tensions over Nord Stream into full view at last July’s NATO summit, raising the issue as he attacked Merkel over Germany’s slack defense spending. U.S. restrictions would potentially hit companies in Austria, France, Germany and the Netherlands. Royal Dutch Shell Plc, BASF SE’s Wintershall unit, Uniper SE, OMV AG and Engie SA are Gazprom’s partners in the project. The Russian gas giant reported a record 201 billion cubic meters of gas exports to Europe in 2018 and plans to maintain those volumes into 2020. Schmid maintained that the project, which would double the 55 billion cubic meters of natural gas flowing through the original Nord Stream pipeline that opened in 2011, isn’t in danger. He also defended SPD support, particularly in Germany’s east where, the pipeline makes landfall. But simmering geopolitical tensions are having an effect in Germany. “Something has changed,” Peter Beyer, the German government’s coordinator for trans-Atlantic relations, said in an interview. He attributed the mood shift on Nord Stream as much to concern about leaving EU allies out in the cold as with Russia’s recent maneuvers. Merkel’s government may have to adjust to the demands of those taking a harder line on Nord Stream, he said.